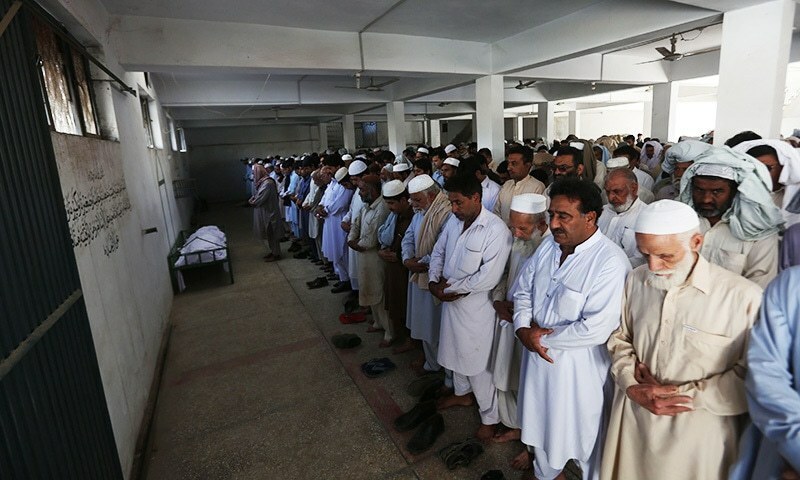 At Mashal Khan's funeral, the imam at the local mosque refused to read the last rites, according to Swabi resident Salman Ahmed. A technician who was asked to do so in the cleric's place was confronted by several people afterwards. The day before his death, a heated debate over religion with fellow students broke out at the dorm and led to people accusing Mashal of blasphemy against Islam. That attracted a crowd that grew to several hundred people, according to witnesses. The mob kicked in the door, dragged Mashal from his room and beat him to death, witnesses and police said. WARNING: GRAPHIC CONTENT. An eyewitness's video of Mashal Khan's lynching. Mashal's death is the latest violence linked to accusations of blasphemy in Pakistan. Those who knew Mashal described him as an intellectually curious student who openly professed devotion to Islam but asked many questions. “Whatever he had to say, he would say it openly, but he didn't understand the environment he was living in,” said one of Mashal's teachers at Abdul Wali Khan University, who declined to be named for fear of retribution. Aziz ur Rehman, a caretaker at the hostel who witnessed Mashal's debate with his fellow students, said he brought up arcane subjects. 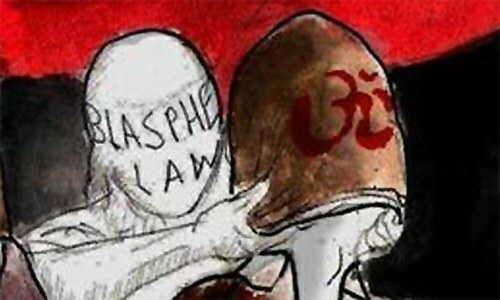 Crimes related to blasphemy are a serious offence in the country and penalties range from small fines to the death sentence. At least 65 people have been murdered over blasphemy allegations since 1990, according to figures from a Center for Research and Security Studies report and local media, and dozens more convicted of the crime are currently on death row in local jails. In March, Prime Minister Nawaz Sharif issued an order for the removal of blasphemous content online, and said anyone who posted such content should face “strict punishment under the law”. Police say they have arrested 20 suspects involved in Mashal's murder and have found no evidence to substantiate blasphemy allegations. Rehman, the caretaker, said Mashal was alive when the police arrived, but that they did not approach the hostel until it was too late. “They could have easily saved his life but they stood away from the mob ... I heard one officer say it's good that they sent this non-believer to hell,” he said. Mardan police chief Mohammad Alam Shinwari denied the allegation that officers did not do enough to save Mashal. “When we entered the campus, he had already been killed and the mob was trying to burn his body,” he said. In Mashal's home town of Swabi, around 60km south of Mardan, his father, Iqbal Shaer, said the accusations of blasphemy were unfounded. “First they killed my son and now they are adding salt to our wounds,” he told Reuters. Shaer, who runs a small business selling biscuits and chocolates to local retailers, said he had always been a lover of poetry and literature and encouraged his children to express themselves and appreciate the arts. How do these imams and people know they are righteous and have guaranteed entrance to jannat! Sad when we fail to basically respect human life to its final abode. Sad and sorry state of affairs!! If you cannot beat the intellectual in debate, you beat him physically. Because it's easy way to keep him silent - forever. It appears the Pakistani are indeed very afraid to express their views about this sad and tragic incident that led to murder of an innocent human. We are going through a very dark period, most of the Pakistanis have become intolerant. Sad indeed very sad!!! Shame on all those who standby and let this happen, they are not humans, muslim or civilized. These mullas are expert in declaring fatwas. They dont know anything about the world outside of madressa!! This is so disturbing to know. Without proper education, only religious knowledge is incomplete. The current mullas are produced from an incomplete system and therefore they can not judge rationally. It is possible he did this out of fear and not his belief. We all need to work to bring a positive change. Mashal's death should be the starting point. The killers need exemplary punishment very soon. All this brutal murders will be repeated if it is not made clear to extremists through expemplary punishments that no one is above law. So the voice reason is silenced. Are these people understand human evolution. These questions will be asked by everyone in the near future as the curiosity of the human mind increases. Is this not an IS act with vengeance? shame for all human rights organization, religious scholars and political leaders who are sitting silent. As a nation we all are in small way responsible for his untimely demise! We should all be ashamed! Intolerance intolerance and just intolerance. Where we are heeding to? Shame on all those who are here to witness this heinous crime and do nothing about it. Very sad affair of Pakistan. We as a nation is crippled and have no sense of any kind, even no like animals. I have never seen such brutal act in animals, even in beast. Unfortunate. Moulvis have created their own religon. Just imagine Prophet Muhammad (P. B.U.H) teachings never allow abusing a human being, what to talk about murder of someone. 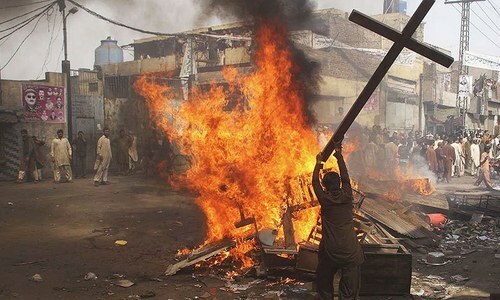 Blasphemy laws definitely need revisiting. Far too many innocents have died due to such archaic laws imposed upon our society in Zia's era! If any religious party or fundamentalists come to defend the perpetrators, Book them in the case as well. Now is the time to put a leash around their necks. Government should also come out of its slumber and openly declare it as a crime of highest degree. I will go to Hell or Heaven, only God Almighty knows. But where this collective attitude of us is leading the Muslim nation is a few dollar question. May God Almighty guide us to the right path. We Pakistani need to look inward before looking outward. Punish the 20 arrested for killing this young man for swift justice. There are many such examples of such martyrs being killed for challenging authority in the west, mashaal has joined such a list from Pakistan. However long term this hatred filled mindset will lose this battle, you cannot keep everyone ignorant forever. The world is changing and so is Pakistan. Civilisation will win in the end against this barbarism. We don't need ISIS or any other, we are enough for each other. Country need a strong, corruption less and fearless leader to eradicate all evils. Is he born or yet to be born? Violence is the last refuge of incompetency. Let Almighty decide any souls destiny after death. Imam should have complied to his duty ! Many people in Pakistan criticised India for intolernce. How would Pakistan justify the current affair of Mashal? Most of our so called mullah have no in depth knowledge of Islam and most of them just follow what they have been told or taught. They don't bother to do further analysis and research. It's time to bring all madarsah in main steam of education without further delay. @KT , Imam is also a human and he is afraid of danger to his own life from extremists. The nation that is ranked one of the highest in the list of most corrupt is concerned about blasphemy. Shame on us for being a nation with no moral values. Pakistan is in the stranglehold of radicals. I have no hope, because it will not going to change anytime soon. Zia-ul-Huq has done irreparable damage to the country and the society. This is not the first time that the enraged group of people killed an accused of blasphemy but this is the first time such incident occurred in a university where students entered to learn and become a sincere, honest and law abiding citizen to serve the country but unfortunately as we are living in an intolerant society where the imams and clerics will decide our fate who will entered to Jannat (Paradise) and who not the result would be same and people will decide the fate of an accused person. When there is a law in country why these people take law into their hands, where our law enforcing agencies specially police who could save a life of an accused person. We are already fighting against terrorism but it is the need of the hour that we should fight to change mindset and operation should be launched against these extremists and eliminate them from our society. If the responsible of Gojra, Joseph Colony or Kot Radha Kishan would have been given exemplary punishment we could avoid these type of incidents repeatedly and could save precious lives of an accused or innocent person. The apex court should take notice of the incident and take suo moto action against the culprits, the university administration and the local police too. We do not deserve a tolerant society, as we did nothing to make it tolerant. Rather we remain bullish to liberals, to our women, to minorities and to every other persons and things that questions our version of everything. A civilized, law abiding, developed nation is becoming a distant dream day by day. The society has sunk and continues to sink deeper. I see no leadership on the scene for course correction. Current leadership can take historic turn by first studying the course envisioned by the Quadi-e-Azam Muhammad Ali Jinnah and then implementing it without modifications and without compromises which shall allow the country to rise. Let's name Wali Khan University as "Mashal Khan Shaheed University" to protest hatred and protect reason. @tRUTH HURTS Very true. He was the one who radicalized the society to lengthen his tenure. He also gave us gift of drugs and weapons and mullahs. @freed hussain Dont say that something like this never happen in America. Somethings like this can happen in any countries. In Canada trump supporter killed 7 muslim and burn the mosque. How about United Airline dragged man broken his teeth, nose etc. Many negative things do happened in America and Western countries. Did imam listen what is mashal blamed for from his own ears. The imam is among those people who spread hatered among muslims. @NP Somethings like this happen in India too. Nothing new. It means that no matter how many universities and colleges sprung up in Pakistan whenever it comes to a matter of blasphemy , every learning and ethics will always be put side and become worse then animal and kill your target instead of discussing and teaching the opponent in a humane way. We should not only respect Islam but we also HAVE to follow it as well. @truth prevails They are heavily funded by middle eastern gods to promote their agendas and fight their wars. Think why Saudis came to KPK to support JUI and JI? Do you think they came empty pockets? The murder of Mashal is nothing but pure barbarism. It has nothing to do with the teachings of Islam, a religion of tolerance and peace. Even if he had committed blasphemy, nobody had the right to take the law in their own hands. We are becoming a society of ignorant and intolerant savages committing the most horrendous crimes in the name of Islam. Unless the society in general and the government in particular takes immediate and effective steps to stop this growing menace, we as a so-called Muslim nation are doomed. What is more worrying is no one still dares to take up this cause on the streets. RIP young man.My condolences to the mother and father. @tRUTH HURTS Just pray Raheel Sharif won't drag Pakistan to Saudi and UAE war. It's not our war. Let Trump deal with Saudis which will happen in near future. This is result of absurd and blatantly wrong policies practiced over many years.......the country is paying a heavy price for this . Law and order is the power of the state and mob shouldn't take that power from the state. Terrorists take law into their hands from the government's hands which should not happen. This shows their narrow mindedness and ignorance.They are a blot on the name of humanity. Condolences to the grieved poor family. In this hour of pains and sufferings God bless them with patience. The whole story is beyond belief. What a country where 2rs mullah refuses last rightes to a murdered young man. How low our narrow minded and brainless society have to go. God bless the young man a place in heaven. Please save Pakistan. I am moved deeply after reading the last paragraph. May God give strength to his parents. Ignorant bunch they called Imams there. Root cause of unrest and barbarism. These traits in our society were nurtured over a period and it would take a while to open people's mind to a point where these debates can start to take place. Mashal was too early and idealist for his time. Why are these fundamentalists in majority and the people who claim that they condemen this act in minority when it is happening. It should be the other way round and see how those few fundamentalist run away. All we need are brave people to confront these fundamentalists and they will run away and hide. But why are we quiet when the attack is happening and then become paper tigers and condemn this. I'm increasingly becoming disappointed with this society. Any glimmer of hope? Any beckon of light? Can those protesting here, come out on streets and protest against the barbarism? It is sad that there is no fear in coming out on street to do a barbaric act but there is lot of fear in coming out against it. It is the reason why Pakistan is going down the hill. @tRUTH HURTS : More than needing a good leader, you need a good education system. Sad to say but I have lost hope for this society. Anyone who has a different opinion has no place in this society. This incident like many others made me so sad. Living abroad I always think of coming back to Pakistan one day and living there in my country but when i see such inhumane acts and a considerable portion of the population justifying and supporting that, i am happy im not living there. I just feel ashamed the people who did this were fellow Pakistanis. It just makes me sick. Ignorance, intolerance, illitracy and religious extremism has engulfed the country. That society just knows how to silence you if you're trying to make a change. @Azhar : Most of us do our primary education in Madarssahs, hopefully everyone has at least learned something about the religion. Mashal was killed by a mob of hundreds of university going students, for sure no one in this crowd was uneducated or had criminal upbringing. Imam who refused Mashal's last rites heads a religious institution, for sure he is one of the most respected muslim. University administration who issued notice against poor victims are entrusted to educate our next generation, for sure they are one of the most respected in the society. Forget police, we don't trust them anyway. Who is left in this whole episode? Students, university administration, imam, police, politicians and even common people ... forget preventing this barbaric lynching, they are not even willing to raise their voice. If these are not muslims then who is left? A Society must get rid of these religious narrowmindedness. Religion is there to perform peace and harmony but not hatred. I myself is a believer and I am convinced, that God is against any Kind of violence, hate and killings. 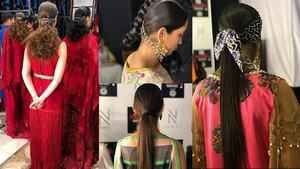 This is the result of deviating from essence of true messege of Islam. Long live Mashal Khan. He is not dead, but a martyr. Such a cruel and heinous act. PM and CM and Imran Khan have also condemned it. I'm sorry what, who and when you got this righ?!!??! Mr so call imam? Arrrrrrrrghhhh!!! I hope they just leave us for good, hate infested minds. @Adnan 2 Why don't you accept the fault and mixing the different issues. The dragging of the passenger of airline is not a religion issue. The airline accepted its cult and apologies. This case in name of religion you are taking law in your hand killing the people without any proof. This madness continues to paralyze the society. Freedom is always the freedom to think differently but alas! in Pakistan the opposite is the case. @Jo There is a big difference between"righteous" and "self-righteous". I would also like to pray for the soul of Mashal Khan. May he rest in Jannat and may God give his family the strength to bear the grief. Finally, I would like to pray for progress and prosperity of Pakistan and that its people are free from fear and intimidation. @Mo Ash: Pakistanis may be are afraid to express their views but the Imam at the mosque did not hesitate. @Nasir London we are not afraid. We condemn his murder in the name of religion. @tRUTH HURTS If Imam can not stand what is right or wrong he shouldn't be Imam. @Salmam Bhulley Shah opposed the Mullah's bigotry and so did all the sufis. Their message nedds to be revisited and revitalised again. There is no room for debate anymore in Pakistan. The country has been lost to the unlettered. May The Almighty bless this child's soul. @Adnan 2 but far less than this burtality brother. And if happens their system does accountability and justice but it never happen in our system rather the ignorant criminals are made hero's here. These imams should be booked for promoting extremism. So sad , he was a good intellectual, society could not utilise his democratic and his own view, every person shall perform the platform to expose his view, as per country law, but shall not be by the people, only by the law, with tears..
My country has been feasted upon for the past 60 years by the absolute corrupt. Where were these mobs when the looters strangled us? Where were these lynchers when daughters are abused; children scared? A shameless act!The semi-baked clergy and the common people of the country who think that they are the self appointed guardians of Islam in this whole world are responsible for this gory murder!The judiciary and the law and order machinery should now act without mercy towards the perpetrators! For those who are criticizing Mullahs, they need to know that these Mullahs belong to and were raised and bred in same environment which these critics were born. Therefore any expectations from them is useless. Moreover Islam requires every individual to personally improve himself. No need and no outcome to criticize Mullahs. Let us see what the non-Mullahs have done good for Pakistan e.g army, judiciary, politicians, police,bureacracy, police etc. Finally killer of Mashal Khan were students not Mullahs. It hurts to read this "My wife told me this morning that she spent her life taking care of her son, but those who killed him have wasted that long struggle.”. Imagine what it would hear this. 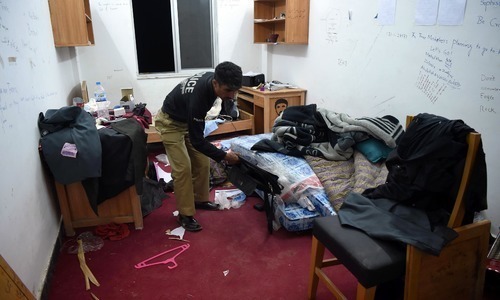 Pakistani authorities may deny there is any ISIS in the country, but look no further than a University and not even a Madrasa to find your ISIS brand of generation. Sad and hopeless where this country is going with upcoming generation of so called educated. It is heart breaking to think whatif my children are lynched by these monsters just like Mashal was lynched. Remember how we criticised India on what happened in Gujrat.? So how long are we going to wringing our hands, and when do we start the process of change. Change in ourselves and in those around us. Change in the laws, in the mindset and in the outcomes. @Jo Actually they r threatened and for the sake of familt they have the right to refuse given the environment surrounds Jahiliyat. I hope for once we see true and swift justice in this so called State. Sorry to say, Pakistani society is hostage by handful mullahs who lack knowledge as well as preaching for division in society. Intolerance in society is basically the outcome of these people who are teaching hate and act with narrow-mindedness. What proof this so-called Imam had about the deceased's balsamic act? The government shall set an example and punish the perpetrators to discourage people of such dirty mind sets. With so many murders committed after passing of the blasphemy law, Its time for the Pakistan nation to be rid of this draconian law. @Skkk (quote): "Mashal's death should be the starting point." How many 'starting points' has the nation already had? One common thing b/w student of Modern education (university) Or student of madrisa(mullah) is "extremism".The former shut down the light of mashal ,Later endorsed the action by deny to read last rites. people who got him murdered were the people that probably lost an argument or debate on a topic. This imam should be banned for ever. People like him are the real problem for our society. It is sad that this happened, sadder that it won't be the last and saddest part is that the desease has been transmitted to the next generation. The Imam who refused to perform the religious rites of the murdered student should be sacked from his job by the Government. this imam sahib should be investigated as well..on what basis he is declaring him a criminal..but nothing will happen ..
Look at the number of people who turned out to protest against the murdered of the Punjab Governor and look at the number who turned out against the murder of this poor student. Tells you everything you need to know about Pakistan. If story is true, then shame on this imam. Praise to the man who performed Janaza. The students who killed this poor guy must be brought to justice. Need to make an example out of these criminal and religious thugs. What a shame that we get carried away without verification and murder anyone. On the other side, our religious people without verification just authenticate such killing and refusal to lead prayer often deceased. What a negative picture we are depicting as muslims, intolerant bunch of goons. The imam should be removed and investigated for his views on this case and prosecuted if needed. Education is the key people. stop sending kids to madarssas and to regular schools to learn about Science, math, literary sciences and learn to open your mind. You can follow your religion but respect others who have different opinions and coexist and not kill them for their religious or atheist beliefs. You cannot expect others to respect your religion if you kill everyone who may have a different viewpoint. This is terrible ... Now we hope the people who conducted this action will follow the preachings of our great religion Islam and will present themselves openly like Qadri did and confence their deed and certainly will prove the blasphemy conducted by Mishal. . Does life hold any value? I hope the technician who led the janaza prayer does not lose his own life the way things are going. The Imam was playing to the audience. No justice without punishment. @Hasnain Haque If anyone would have tried to intervene, he or she would have met the same fate. It is easy to say what you are saying, but it's almost impossible to act on that. Cant blame them as one cant take chances in these matters. And people who are complaining are hypocrites as its not like they are tolerant of other religions or ideas. Its just that now they can sit on the sidelines and comment on the people who were in the position where they had to make a choice and did so. What a coward. He should be fired by the Auqaf department. @Dr tariq . I think you do not know what your religion really teaches you. Despite the evidence all around Muslims have their head in the sand. It is very sad.We must be kind to all.God is kindness. What a sad news! My deepest condolences to the family and friends of Mashal. There are no words that can possibly explain or lessen the pain they are going through. Has religion or the politics of religion become so big in Pakistan that a young boy's life be taken? Please people - commenting here is fine but you really need to abolish this archaic law. Walk on the streets, pressurize the vovernment, make sure this doesn't happen to any other young boy. Regards and Condolences from across the border. This is cruel, no one is allowed to murder. This is truly sad and a wake-up call for all of us that we should accept opinions of others and answer there questions with knowledge. We are dying society, who will do funeral of this society, shame on us! People should not take law into their hands. They should have handed him to police if something wrong was said. Go back to basics, the Family and the School are the only places to develop respect of life no matter how 'ugly' it may appear in our prejudicial vision. It is a tall order, but then does anyone has an alternative? If you can understand humanity. Policy makers in Pakistan may use blasphemy to silence critics, liberals, human rights activist etc. But the effects are showing, when religious fundamentalism is being mainstreamed at education levels. Mashal had higher intellect than any imam or mullah, he deserves better. Mashal was a humanist and tolerant person in a society that knows the opposite. Jamshaid sadiq Long live Mashal Khan. He is not dead, but a martyr. The Imam of Swabi Mosque must be questioned for not leading the funeral prayers of Mahsal Khan. Imam has every right to do that..
@aslam shaikh "They should have handed him to police if something wrong was said." Is the police equipped to judge what a university student says? @haider shaikh . Mashal is a hero to many, Mashal's spirit "be curious, crazy and mad" is alive and well, wherever human's live. Mashal simply lived in the wrong place at the wrong time, with the wrong people. My sincere condolences to the near and dear ones, Mashal was cherished by his parents as any parent cherishes their son and daughter, the murders in cold blood by so many fellow students indicate, the mind set of the millions of people. This is a very sad reflection of the mindset of people of this country, where we are and the direction where this country is heading. I would for starters stop praying behind this person (the so called imam). I would rather pray with a friend or a complete stranger but not him. To the place in Swabi (where mashal lived) fire this person immediately and stop praying behind him till he realizes his mistake and apologizes. @truth prevails Respectfully I want to suggest a minor modification to your post, it not that are not aware of what is happening in the world their view is obscured by the cash they receive for these services. @NP Injustice has no religion, culture or geographical boundary. Whether its done by individual or governments. Anyone involved in injustice will have to pay the price on day of judgement. I say it again, to include religion in politics is a very dangerous thing because once this genie is out of the bottle it is impossible to put it back again. Religion is between a man and his God and has nothing to do with others. The benefit to stoke religion in politics is very limited as before you know it will backfire and come back to haunt you as no one is perfect. Here is my point - every Mullah and so called religious scholar/ulema in Pak was eager to implement the blasphemy law to punish the minorities without understanding the pros and cons of bringing religion into the law. They thought they were doing the right thing but they can see now how quickly it has backfired because right now no one has the courage to speak against it because they are afraid of their own fate. So my point being, the problem is the same law that was enacted against the minorities has come back to haunt us all. The problem is we can not answer some basic questions regarding our religion or culture...forget about intellectual questions because of mere ignorance...So Sad ! Illiterate, frustrated, and mad people even at the university level in Pakistan! shame on such elements..
Trust GOD. Leave punishments and awards in life to Almighty. who the hell are we to decide anyone's faith or belief. this was a horrific and the worst kind of Jahliya. Killing an innocent man because you decide he is wrong. The Imam should be arrested for not doing his duty and removed from the mosque. It is shameful of Imam for not giving his last rights. Very sad. Be realistic -- dont blame, the laws the mob, dont blame Qadri and people like them, but one must understand the enviornment in Pakistan. People here love the religion more than anything else.The laws protecting Islam will never change in Pakistan, at least in near future. Hoever, the lawmakers shouls clarify and explain the laws, at the same time educate the people. God Bless Pakistan and Islam Zinda Bad. Who are we to decide on some's fate? This is the function of the courts. These people, including, many mullahs are taking us back to Jahalia. Imams like him are encouragiing intolerance. He should be removed. I strongly condemn the brutal killing of the young fellow. However I also believe that the Imam had a right to decide independently whether finds himself suitable for leading his final rites or not.